The nerf bar is a practical way of climbing your truck. It can be especially helpful if you own a tall truck like a Chevy Silverado or a GMC Sierra. One good thing about the nerf bar is that it will immediately enhance the look of your truck by giving it a sporty look. But above all, it helps protect the side of your truck. This is beneficial if you drive on tight roads where the risk of scratching the side with the curb is bigger. Without any further ado, our review below will help you find the best quality nerf bar for the money. Let’s get to it! The Tyger Auto may not be the best nerf bar on the market. However, it has many good things going for it. For one, it has an excellent price to quality ratio. In fact, this model is the most affordable nerf bar that you can buy in this review. In order to ensure that it can hold your weight, this nerf bar is made from steel. It is also corrosion free and weatherproof so it will not rust over time. In fact, the whole surface of this nerf bar has been powder coated for rust resistance. In addition, the diameter of 4 inches ensures that you have a large space to stand on. There is a rubberized material on top that is anti-slip, so it makes it safer. 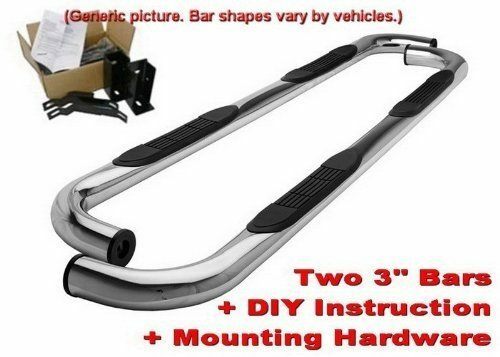 As long as this nerf bar fits your vehicle, you will have absolutely no problem with it because it is a popular model that is durable and easy to install by absolute beginners. 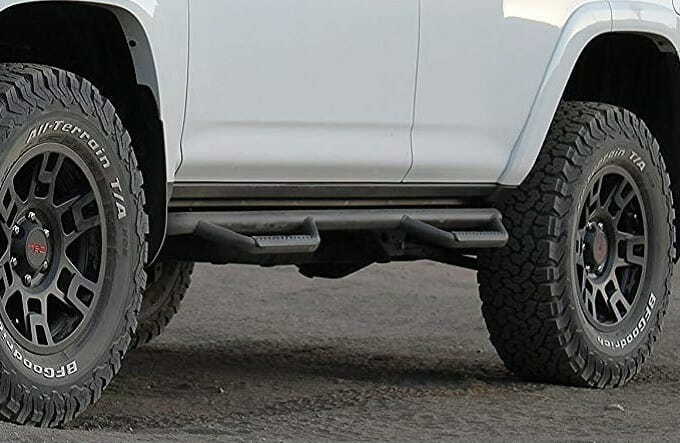 This N-Fab is a rounded nerf bar that has been engineered to fit the Toyota Runner. It is quite small in size as it measures only 2 inches, but it quickly makes up for it by being very robust. Indeed, this nerf bar is made from high-grade steel, so it is extremely durable and long-lasting. There is also an attention to detail in the engineering of this nerf bar. It has been manufactured in Texas, so the quality control that goes on in the production of this nerf bar is definitely superior when compared to other models in this nerf bar review. In addition, this product comes with an impressive 5 years warranty, so if you have a Toyota Runner, then you have nothing to worry about. This nerf bar will not fit the limited edition of the Toyota Runner. This product will also not fit any Toyota Runner with cladding under the doors. 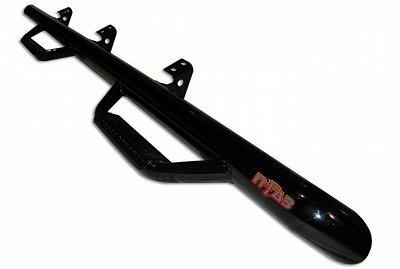 If you own a Toyota Runner SR5 or a TRD model, then this nerf bar by Westin may be the right choice. It comes with all installation accessories out of the box, and it also has a detailed instructions manual that will show you exactly how to install it on your particular type of vehicle. What separates this nerf bar from the rest of the competition is its OE style bends and a large rubberized surface that makes it anti-slip. You can comfortably stand on this nerf bar for an extended period of time and not feel fatigue or slip even in wet conditions. Moreover, since it is made from a mild steel material, it will last a long time. The manufacturer has also powder coated it, so it is fully waterproof and weatherproof. If you own the above vehicles, then we highly recommend this top-rated nerf bar because of its durability and large standing area of 4 inches. It is difficult to find a universal nerf bar that will fit any truck out there. This is mostly because the nerf bar is a specialized accessory that is often made specifically for a particular type of Waco. This is a problem that this Lund model is here to solve. Indeed, it offers a universal fit to almost any vehicles as long as the dimensions match. Moreover, it has a wide surface of 5 inches so you can comfortably and safely stand on this nerf bar, no problem. Of course, the surface is anti-slip as well. It is made from a steel metal which makes it quite tough and provides it with a decent weight capacity of 350 lbs. All in all, considering its universal fit, this Lund unit is definitely one of the best nerf bars for trucks out there. The only caveat is that it could have been a little bit more cost-effective. It has been proven that rounded nerf bars are generally safer to use on your truck. Round nerf bars will easily deflect an obstacle which can prove to be helpful, especially if you usually drive in tight roads with curbs. It would protect your truck from scratches. This is exactly what this TAC Truck nerf bar is all about. It will provide you will Chevy Silverado or GMC Sierra truck with side protection. In addition, it will immediately uplift the looks of those trucks as well, providing it with a much sporty look. When it comes to installation, no problem as there is no drilling to be performed. It will fit your vehicle model right out of the box. But what makes this model truly exceptional is its affordable price. Indeed, it is the most affordable model that you will find in this nerf bar review. If the price is an issue, then this model is an excellent choice! The ionic is a large and stylish nerf bar that will make your Toyota Tundra look sportier than it already looks. With its size of 5 inches, you will have a lot of space to stand and even walk on in all safety. Best, once installed on your truck, it is aesthetically pleasing and somewhat discreet as well. The top of the nerf bar has heavy-duty rubber pads that will prevent you from slipping when standing on it. This nerf bar can comfortably hold a person of average weight because it has a rated weight capacity of 350 lbs. More than enough for the average person. Furthermore, you can purchase this nerf bar is different colors to suit the looks of your vehicle. Neat! If money is not an issue, then the N-Fab is one of the best-quality nerf bars that you can buy. This model will fit any Dodge Ram truck with ease. There is no complex installation to perform with this kit. It has been made so that you do not need to perform any drilling on the underside of your vehicle. Also, since this bar is made from steel, it will offer you with a long lifetime. It will not bend or break while you are standing on it. Its size of 3 inches is definitely not the biggest we have seen, but it is still large enough to provide the user with comfort while standing on. MaxMate is a popular brand and consistently rated as being one of the best nerf bar brands on the market. Consequently, they make high-quality nerf bars that are not only durable but aesthetically pleasing as well. This current model sports a stainless-steel build construction that is resistant to rust and corrosion. The surface is also UV resistant when it comes in direct contact with sunlight. Of course, there are heavy-duty rubber pads on the bar to provide your feet with traction and prevent you from slipping. Additionally, it has a decent weight capacity of 350 lbs so it can definitely hold a person of average weight with ease. 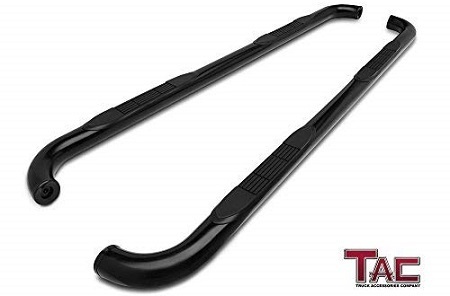 If you own a compatible vehicle, then this Westin oval nerf bar is an excellent model to consider. It is made from stainless steel so it will not corrode over time as it is fully waterproof and weatherproof. Further, the ends of this nerf bar are closed so as to prevent any moisture or debris from entering and corroding the inside of the bar. Very neat! You also not need to perform any complex installations like drilling under your vehicle to install this nerf bar. It comes pre-fitted and is easy to install. And when it comes to safety, no problem there as well. There is a thick rubber pad on the nerf bar for you to stand on. It is ergonomic and anti-slip even when wet. Rough Country is a popular brand that makes quality accessories for trucks and other types of vehicles. Indeed, this company is noted as being one of the best nerf bar brands that you can buy from. They are highly reputable. Consequently, this wheel to wheel nerf bar is a high-quality model that is backed by a solid 3-year warranty from the manufacturer. In addition, it will fit any Jeep JK Wrangler, and there is only minor drilling that you need to perform. Simply position the nerf bar under your vehicle, drill a few holes, and bolt it in position. But what really makes this nerf bar unique is its high weight capacity of 465 lbs. With such a high weight capacity, it will have no problem holding multiple people with ease. Both the nerf bar and the running board are 2 popular options for your vehicle. But which one is right for you? In the beginning, nerf bars were used in racing cars so as to protect the drivers from side collision which is quite frequent in a race. The nerf bar has proven to be so practical that truck manufacturers have quickly adopted it. Not only did it make the truck more aesthetically pleasing by providing it with a sporty look, but it also made it safer the driver. The main advantage of the nerf bar is its discrete look as it is not too big so as to become the main attraction in your truck. However, it is still practical, and you can easily stand on the nerf bar because most top-rated nerf bars on the market have a decent carry weight of at least 350 lbs or more. The running board functions similar to the nerf bar. However, what separates this type from the nerf bar is its size, especially its larger diameter. Indeed, as its name suggests, there is enough space on the running board for you to “run” on it in all safety and comfort. 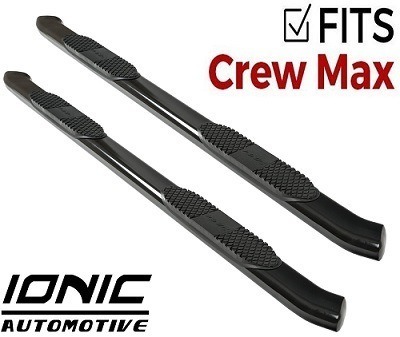 The main disadvantage of the running board is since the diameter is so big, it can easily collide with obstacles especially if you use your truck on narrow roads. 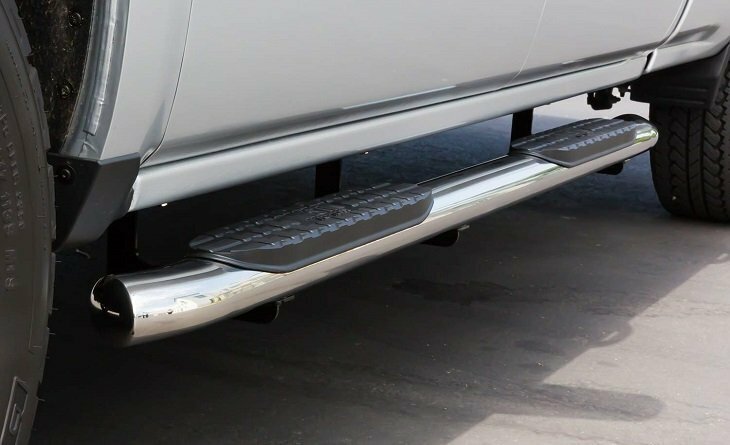 However, when it comes to standing comfort, the running board is simply unbeatable! First of all, you must ensure that the nerf bar fits your vehicle. Not all nerf bars are made universally so measuring the dimensions, especially the length from door-to-door of your vehicle. This will show you if the Nerf bar you are considering to purchase will fit. Moreover, there is an aspect of aesthetics to consider. Even if the nerf bar fits your vehicle, you have to consider how it looks as well. The rounded nerf bar has its tips rounder and is built more for aesthetics. 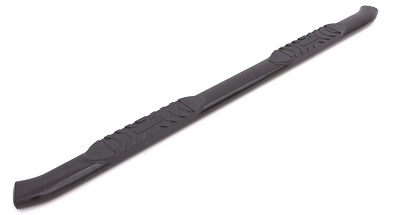 It is also generally safer when compared to other nerve bars on the market because the round tip will easily brush away any obstacles it finds in its way. The main disadvantage of the round nerf bar is that the ends lack reinforcements and are not recommended for you to stand on for an extended period. 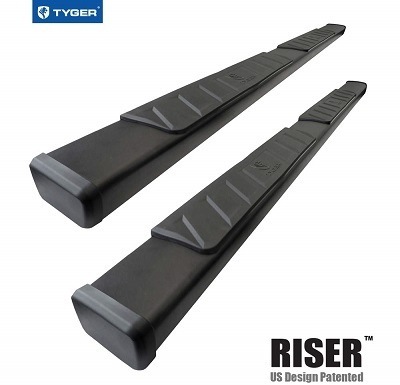 Since the oval nerf bar has a flatter surface, it also offers you with a wider surface area for you to stand on. In general, this type of nerf bar measures around 4 inches to 5 inches in diameter which is large enough for almost anyone. This makes the oval nerf bar safer and more ergonomic to stand on. The step nerf bar has been designed so as to makes it easier and safer to get on and get off of tall trucks. This type of nerf bar can be especially helpful if you tune your vehicle with bigger tires which normally raises the vehicle by a significant amount. Therefore, it will not be awkward for you to get in your vehicles with the step nerf bar. The cab length nerf bar is a little more discreet when compared to other types. However, it still remains safe and ergonomic because most cab lengths nerf bars have stepping pads on each tube that makes it safe and ergonomic to stand on. 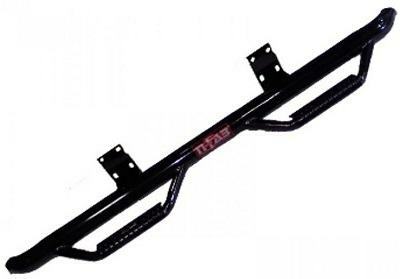 Moreover, this type of nerf bar is most of the time standard in design and provides footing for both rears as well as front passengers. The wheel-to-wheel nerf bar is one of the most popular types that you will encounter online. This type of nerve bar is very easy to install, aesthetically pleasing as well as highly functional. Indeed, it usually contains multiple stepping pads for both front and rear passengers. In addition, you can easily stand on the wheel to wheel nerf bar while your vehicle is moving because it is stable, comfortable and quite safe. Not only do you have to consider the overall length of the nerf bar so as to ensure it fits your vehicle, but you also have to consider its diameter. Indeed, a nerf bar with a bigger diameter will be more ergonomic and safer to stand on. However, in nerf bar that is too big maybe a security hazard especially when you negotiate tight roads that have a curb. The risk of collision is very high. So, it is best to choose a nerf bar that is of the right size for your vehicle. You must also consider the material so as to ensure its durability. Most of the time, the nerf bar is made from steel that is not only very durable but is also weather resistant. However, the main caveat of a steel nerf bar is its price. Remember, the nerf bar is not only there for aesthetics. It also provides the side of your truck with protection, so a steel construction definitely makes it more robust against impacts. The nerf bar makes it easier for you to step inside your SUV. It can be very helpful especially if you have a tall vehicle. Most models even have an ergonomic and anti-slip surface for better security. In addition, the nerf bar is also very practical as it protects the side of your vehicle from the curb. You also do not have to worry as this accessory is very easy to install and almost no drilling is necessary for the installation. Finally, our nerf bar review above contains some quality models for your vehicle. If you do not know which nerf bar choose yet, go through the review again.